Foreign Trade Zones, or FTZs, are a tool that companies use to increase global competitiveness. Through federal designation of areas considered outside the customs territory of the U.S., FTZs provide users and operators with a range of potential tariff and other bene ts. The FTZ program has proven to be successful, consistently retaining capital and jobs in the U.S. and leveling the playing eld for companies making investment and production decisions. The Port of Portland is the Grantee for Foreign Trade Zone 45. 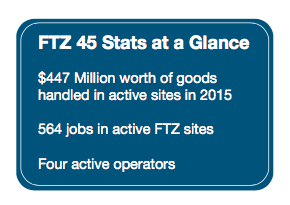 As Grantee, the Port is responsible for the organization, development and marketing of FTZ 45 and manages it as a public benefit as part of the Port’s mission to promote regional economic growth through the traded sector. In many cases, duties are higher for parts than for nal goods. Therefore, in a FTZ, a company can import parts, assemble products and only pay duty on the nal goods. In addition to this tariff reduction, duty is not paid on goods that are exported from a FTZ. Daily or per-container entries may be consolidated into weekly entries, reducing the payment of customs processing fees. Depending on location and use, a FTZ may also provide users with logistical benefit, such as the transfer of goods between FTZ sites duty-free and implementation of best practices for supply chain security. Contact Tom Nelson at 541-766-6339 or Tom.Nelson@CorvallisOregon.gov if you think FTZ would be a benefit to your business. 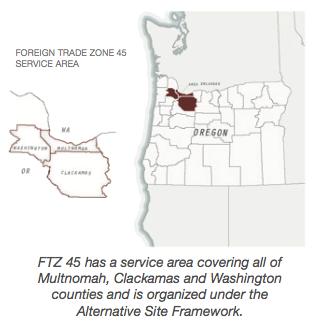 Foreign Trade Zone 45 Service Area. The Economic Development office has been instrumental in our growth as a company and an excellent networking entity. Being involved in the Innovation Ecosystem here has provided us with the support we needed to grow. Find out WHO won Shark Tank this year! Corvallis Economic Development will see you at BEYOND EARTH DAY COMMUNITY FAIR tomorrow!